BARCELONA, SPAIN--(Marketwire - Nov 2, 2012) - Travelers looking to spend their Holiday season awakening the senses and indulging in the finest food, arts and relaxation can look no further than Hotel Arts Barcelona. The luxury hotel is offering special holiday programming for guests and locals alike this season that are sure to create lasting memories. For many, Christmas is the most awaited night of the year, and on this special occasion, Hotel Arts Barcelona will celebrate with the gala celebration in the Gran Salón Gaudí. The experience will transport guests and visitors into a world of luxury and wellbeing. On 24, 25 and 26 December, Paco Perez's Michelin-starred Enoteca restaurant and Arola restaurant by Michelin-starred Chef Sergi Arola have created menus to surprise and delight, offering memorable experiences around the table. 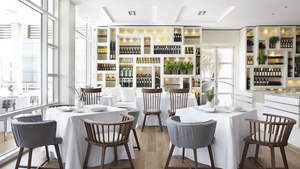 Sample celebratory dishes include the Alt Empordà poularde cannelloni and the Sole a la meunière, artichokes and melanosporum truffle at Enoteca; or exotic suggestions as the Cactus tartar and the Osmosed Grapes at Arola. Guests staying at the luxury hotel on New Year's Eve will find a special selection of amenities to celebrate the night. They will later be able to attend a gala dinner in one of the most spectacular spaces of the hotel, the Gran Salón Gaudí. Guests will enjoy an evening to remember, complete with live music and the finest gastronomy from our Executive Chef Roberto Holz. Hotel Arts' Floral Designer Donna Stain will reveal new creations of arrangements, always exquisite and surprising, naturally inspired by art this holiday season. Those wishing to revel in some exceptional food and drink to begin 2013 can choose to attend an exclusive dinner that will take place in Arts 41. Enoteca's cuisine will be transported to the 41st floor to offer guests a Michelin-rated dining experience in this unique scenery overlooking the Mediterranean. Exclusive Champagnes and wines will be served, including Laurent-Perrier Champagne, Sauternes wines, and local treasures such as Rias Baixas wines. Albert Escofier, sommelier at Enoteca, has carefully created a perfect pairing to accompany Paco Peréz's delicate cuisine on that evening. The few select attending the dinner will be savoring the very last bottles available of a highly valuable wine: Finca Dofi 2007, served in impressive Magnum bottles. This wine from Álvaro Palacios winery will most definitely remain in everyone's memory throughout the New Year and beyond. Enjoy the first brunch of the New Year with a large copious buffet served at Café Veranda, including a live cooking demonstration, fresh Mediterranean seafood and other Christmas classics such as traditional wild boar stuffed with grapes and prunes, and all types of delicious desserts. Between enjoying some of the world's finest culinary indulgences to getting pampered at the Six Senses Spa overlooking the Mediterranean or viewing world-famous art including the Frank Gehry Fish sculpture, a visit to Hotel Arts Barcelona this New Year will inspire and awaken the senses. Hotel Arts Barcelona boasts stunning panoramic views from its unique location on the waterfront, in the heart of the city's Olympic Village area. Designed by renowned architect Bruce Graham, Hotel Arts features 44 floors of exposed glass and steel, making it a prominent feature of Barcelona's skyline. The waterfront hotel's 455 rooms and 28 exclusive duplex Apartments feature sleek, modern design complemented by an impressive 20th century collection of works by contemporary Catalan and Spanish artists. The only hotel in Spain featuring two Michelin-starred chefs, Hotel Arts is one of the premier culinary destinations in Barcelona with Enoteca and Arola restaurants. Guests seeking a serene escape may enjoy signature treatments in the 43rd floor Spa by Six Senses Spas. Recently recognized as the top business hotel in Spain by Conde Nast Traveller, Hotel Arts� Arts 41 provides over 3,000 square-feet of function space overlooking the Mediterranean for board meetings and conferences as well as social events, weddings and celebrations. The hotel offers an additional 24,000 square-feet of function space, with the main meeting space located on the lower ground and second floors. For more information, please visit http://www.ritzcarlton.com/en/Properties/Barcelona/Default.htm. Travelers looking to spend their Holiday season awakening the senses and indulging in the finest food, arts and relaxation can look no further than Hotel Arts Barcelona.